HousingWorks Austin continues to play an active role in the rewrite of Austin’s Land Development Code, a process known as CodeNEXT. The HousingWorks Board of Directors has closely examined Draft 3 of CodeNEXT, particularly as it addresses programs designed to create affordable housing, and submitted comments and recommendations to the Planning Commission. 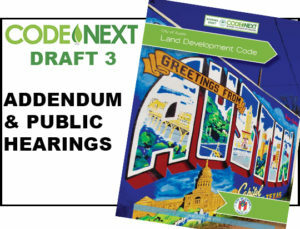 In late April, an addendum, errata and map atlas were added to Draft 3 of CodeNEXT which incorporates changes based on public feedback. You can view the latest version of Draft 3 by clicking on the image on this page. Austin City Council will hold its first public hearing on CodeNEXT on May 29 at 10:00 AM at Austin City Hall. The second hearing is set for June 2 at 10:00 AM, also at City Hall.